A wonderful holiday gift for your family and friends. 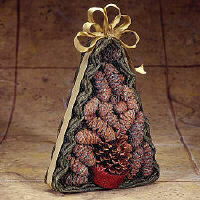 Shaped in the form of a Christmas tree with color cones and pine cone fire starters all wrapped in mesh and tied off with a ribbon. Color cones produce magical blue and green colors to appear in the flames.